How do you get perfectly cooked soup that is velvety smooth in about an hour? Use your pressure cooker and immersion blender! This creamy, belly-warming soup features one of the biggest stars of the autumnal squash harvest. Everyone can enjoy this meal because it is not only quick and easy, but it is also gluten-free. The sweet secret to this Pressure Cooker Butternut Squash Soup is a dash of maple syrup. A bit of plain yogurt makes it rich and creamy. Finally, a garnish of cilantro adds crisp, fresh flavor and a beautiful burst of color just before serving. Heat oil in a pressure cooker set to Sauté. Cook and stir onion, celery, and carrot in hot oil until vegetables have softened, 4 to 5 minutes; season with salt. Stir squash and garlic with the vegetables; continue to cook until garlic is fragrant, about 1 minute. Pour stock and maple syrup into the pot. Stir yogurt and lemon juice into the soup. Blend soup with an immersion blender fitted with the blade attachment on Low. Continue blending and gradually increase speed to High and until soup is smooth; season with salt and pepper. Ladle soup into bowls; garnish with additional yogurt, cilantro leaves, and black pepper to serve. Butternut squash is a type of winter squash that grows on a vine. It has a sweet, nutty taste similar to that of a pumpkin. It is a good source of fiber, vitamin C, magnesium, and potassium; and it is an excellent source of vitamin A. Use 1 teaspoon ground coriander and 2 teaspoons curry powder to turn this into a curried butternut squash soup. Replace the yogurt with coconut milk and the chicken stock with vegetable stock to make this a vegan dish. If you don't have an immersion blender, pour the squash mixture into a blender (working in batches) and blend on low speed, gradually increasing to high speed, until soup is smooth. Per Serving: 118 calories; 4g fat; 15.0g carbohydrates; 5g protein; 5mg cholesterol; 519mg sodium. I couldn't believe how easy this recipe was in my Multipot! Using the immersion blender was clutch for this recipe, I didn't transfer the hot soup to the blender and burn myself this time. I substituted agave nectar rather than the maple syrup and it takes great. Thanks Caroline! I will only ever cook soup in the pressure cooker from here on out! This recipe was so easy. I love being able to sauté and cook all the ingredients in the same pot. The only thing I did differently was use half and half instead of yogurt. Excellent dish! I veganized this butternut squash soup by using vegetable broth and coconut milk to make it creamy. Perfect soup for winter, especially with this harsh weather we've been getting hit with on the east coast! I love being able to sauté and pressure cook in the same pot, it makes it really convenient. I added curry powder and used coconut milk instead of yogurt, not to make it vegan but to add a coconut curry style flavor and it was really good. It didn't even need pepper, I just added salted after blending it with my immersion blender. Love it and will make it again soon. I used heavy cream instead of yogurt to make this recipe because I ran out of yogurt. I also added a pinch of cayenne pepper for spice. 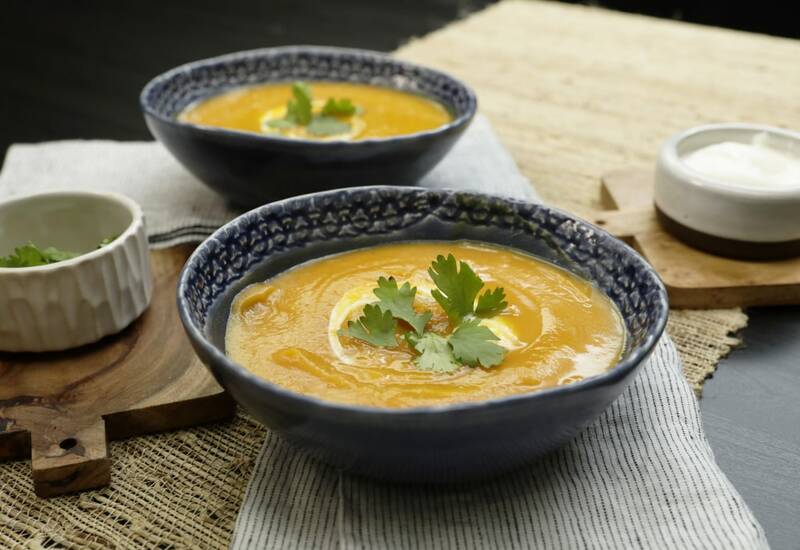 Butternut squash soup is definitely a fall favorite. Great soup, my husband loved it and wants me to make it for him again! I made this soup adding a couple more large cloves of garlic and at least doubling the syrup (good grade from Vermont) to add to the flavor intensity. I also used a dollop of sour cream (not yogurt) and swirled in the soup and topped with fresh grated Parmesan cheese and croutons, delicious! This soup was really flavorful! I added a lot of Moroccan seasoning to the soup, used a can of coconut milk instead of yogurt, added beets and cooked chicken then only blended half. I also added toasted pine nuts at the end as a topping. Every bite tasted different and it was very much enjoyed! We did not like how tangy the recipe is with yogurt. I would follow the instructions except substitute milk or cream. Also one lemon is probably too sour maybe half a lemon would be better. The soup was nearly perfect before we added the yogurt and lemon.